Arts are doing the classical music world a great service with their excellent Archive series that is resurrecting a number of high quality recordings from obscure sources that have lain unreleased for decades. 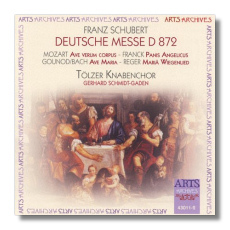 The latest features the excellent Tölzer Knabenchor in some fine recordings of varied sacred repertoire dating back to 1974. Schubert's 'Deutsche Mass' is a compact yet strongly propulsive work that gives important emphasis to counterpoint and melody in the classic German tradition. Gerhard Schmidt-Gaden conducts with panache and empathy and the voices of the Tölzer Knabenchor despatch all with summary ease. It is a version that I would recommend alongside Sawallisch's quite unsurpassable version on EMI which however is now only available in a box set. The other pieces are of varied interest but include a rather finely sung version of Franck's 'Panis Angelicus' and two famous Mozart pieces that have been rather flogged to death, at least in my opinion. The short work by Reger is welcome as one can sample the variety of the Tölzer Knabenchor's repertoire. Good although not outstanding recordings set the seal on another excellent issue in the Arts Archives series that will appeal to choral connoisseurs.